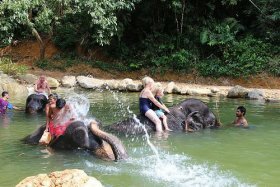 Most of the trips we do as a family from Phuket are done "our own way" without joining any organised or paid tour. And for us that's easy enough as we have transport, we know the roads, we can speak the lingo plus we enjoy exploring on our own. On many of the blog posts about trips such as Phang Nga Bay or visiting waterfalls I will post directions and maps so if you want to hire a car and explore, go for it! For other trips we get help from our friends who have a tour company called Easy Day Thailand - such as when we visited Koh Tachai Island and we've done trips as a group with these guys to Racha Yai Island, Koh Yao Yai Island and more. There is a lot to do here, lots of trips and that does not include local sightseeing to places like the Big Buddha, Cape Phromthep, old Phuket Town. When I stop to think about it, there is way too much to do here! Indeed after 17 years here, we still find new places to explore and there are lots of trips and organised tours that we have not done, I guess because we're not tourists! My friends at Easy Day Thailand started by offering private tours and personal service. 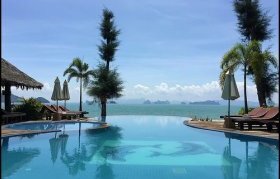 The private tours they offer are my recommendation, but they will also sell cheaper group tours and can offer airport transfers plus some tours in other parts of Thailand like Krabi, Kanchanaburi or transfers from Phuket to Samui or Koh Tao. Pretty much anything really, just ask them - contact here. I have resisted adding any "top 10 attractions" list on the blog, because I think that depends what you are interested in. There are hundreds of pages on this blog and please do spend an hour browsing for information and ideas. You'll find there's more to Phuket than is shown in travel agent brochures. A lot more. Rather than "my" top 10, I asked the Easy Day team for a list of their 10 best/most popular/most recommended tours. The list is not in any particular order. For bookings or questions, please contact Easy Day Thailand. This would normally be the first trip I would suggest to anyone. We have done Phang Nga Bay trips many times, most recently in 2015 - see here : Phang Nga Bay. Great scenery, several iconic views. 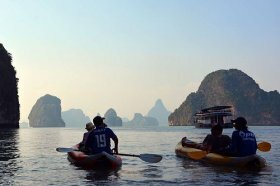 You can do trips like we have done by longtail boat in private groups visiting places like Panyee village and James Bond Island (see photo below), or there is a very popular (and lower price) tour including sea canoeing around several islands and caves in the bay. It's their best selling tour. Kapong is in Phang Nga province to the north of Phuket Island. We have been in this area for a white water rafting tour, but the trip that is really recommended (and I must do it sometime) includes river tubing, swimming at a waterfall and elephant bathing and trekking .. and yeh, I know elephant trekking is not so trendy now, with concerns about cruelty, but I am assured this place really looks after the elephants and they only take small groups. I have not been to Phi Phi for quite a long time. It does tend to be rather crowded and most tours are on big boats with maybe 40 or 50 people. So they can be very cheap and that sounds attractive, and yes the scenery is very pretty despite the crowds, but a private tour is the way to go! Actually, it's best to stay overnight in Phi Phi and get a boat either late afternoon or early morning to avoid the daytrippers from Phuket! Easy Day can arrange that, or a private tour for a day from Phuket, so you get your own boat with a private guide in Phi Phi after taking a ferry from Phuket. And yes, this is more expensive that some of the real budget tours, but really worth the extra. Me and the family must go again sometime. Our last visit was years ago on a seaplane! 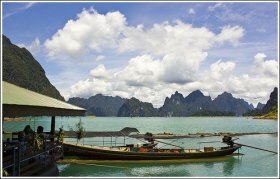 Day trips are possible to Khao Sok, although it's about 3 hours drive from Phuket and it's certainly best to stay a night. We have been many times and Easy Day Thailand use the same hotel that we have used - Cliff and River Resort. Tours include rafting or tubing on the river and/or a trip on the huge Ratchaprapha Lake. We love this area, great scenery, fresh jungle air, a nice change from Phuket! Krabi is on the east side of Phang Nga Bay, and has some attractions that are a bit too far for a day trip such as the Emerald Pool and the Tiger Temple, plus many small offshore islands. You can also ask Easy Day about tours if you stay in the Krabi area, but some are also available from Phuket. 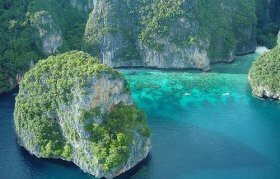 There are various tours available such as a 4 Island Tour, Sunset Cruises, Phi Phi Tours and the very popular Hot Spring Spa. This is a new tour based on a trip we did in 2016 - see Koh Yao Yai Island. Day trips are possible, taking a boat from Bang Rong pier on the northeast coast of Phuket, but an overnight trip is better. Koh Yao Yai is a quiet island and the views from the east coast are great, looking across the bay towards the Krabi coastline. Tours will also include stops at Hong Island and others. Some more great scenery here. 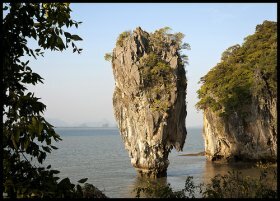 I think you can actually do several day trips in different parts of Phang Nga Bay .. and we have! The Similan Islands I know very well! I spent many months on dive boats there and I am still manager at Sunrise Divers, booking people for diving trips right through the high season from mid October to early May. So please do contact me at Sunrise Divers for diving trips. Easy Day can book snorkelers on a couple of different trips. Day trips are possible, but are a bit rushed. An overnight trip is much more relaxed. There is an option to sleep in tents, but this is not really comfortable (yes, it's cheaper) or you can stay in aircon cabins on a boat called the Pansa Queen. The Similan Islands really are beautiful! (above) Similan Islands "Donald Duck Bay"
The Surin Islands are quite a long way from Phuket, it's an easier trip if you are staying in Khao Lak. Overnight or 2 night stays are possible, camping in the Surin Islands national park. A day trip is possible too. It's less crowded than the Similan Islands (because it's further away) and there is lots of great snorkeling plus you can visit the Moken Sea Gypsy village. Staying overnight is a real "get away from it all" experience. Racha Yai island, also called Raya Island, is a very popular day trip destination from Phuket. There are lots of boats and lots of snorkelers, plus dive boats along the reef and in the bays. I have dived there many times - see : Diving at Racha Yai. 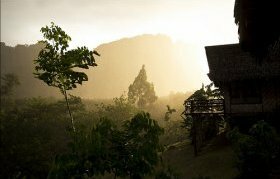 And a few years ago we joined the Easy Day folks for an overnight trip - see : Overnight at Racha Yai. To beat the crowds on a day trip, the early bird tour is a must. Hotel pick up 6 - 6:30am means you get to the island a couple or 3 hours before anyone else! Or you can ask Easy Day about overnight options. If you stay on the island and wake up early, you also beat the crowds!